that he wrote so eloquently on the subject. If it were only for that, the essay would be valuable. thoughts of leaders as well for his role in the history of recent conflicts. these words give to his thinking and interests is invaluable. I also have to note that from a historian’s perspective this professional practice is fascinating. good effect. The General’s essay is an exposition of this principle. public nature of his profession) posterity. Iraq in command of I MEF in February of 2004.
me all the answers, but it lights what is often a dark path ahead. imagined that my HQ would end up only 500 meters from where he lay in state in Babylon). (studying, vice just reading) the men who have gone before us. sufficient for the specifics of a tasking that you have not anticipated? overcoming an independent enemy’s will are not allowed that luxury. only officer I know who has read more than I. China during 1937/8. My favorite amongst his selections was The Education of Henry Adams. Of course, I would be more than just curious to hear your selections. 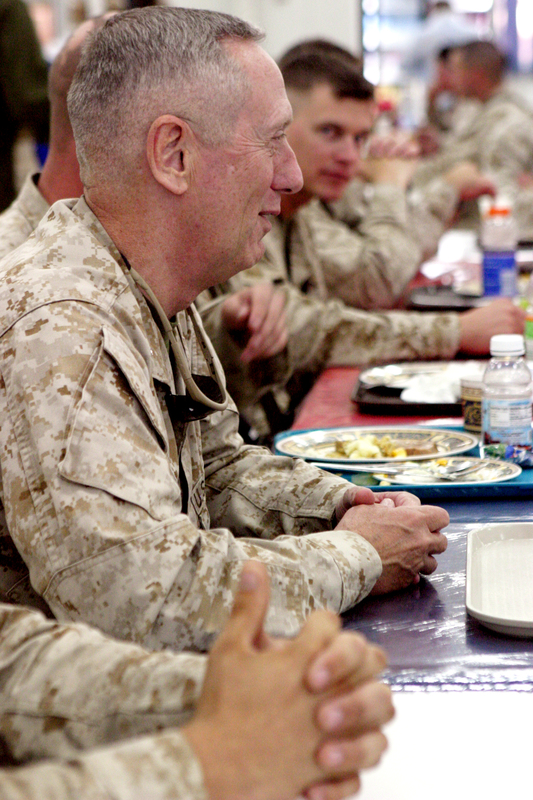 Best wishes for a very happy Thanksgiving to you and your Marines. place anymore because of how different things are, etc. I regret any misunderstanding that my hastily written note has caused, wholly my responsibility. Jill S. Russell is a military historian and doctoral candidate at King’s College London who writes frequently on contemporary foreign policy and security issues. She is a regular contributor to Strife, Kings of War and Small Wars. You can follow her on Twitter @jsargentr. this man should be president. Who was his better-read aide in 2004? General Joe Dunford, his Assistant Division Commander the current commander in Afg. I’ve known him since he was a Captain. He’s every bit as brilliant as Gen Mattis. Sir, if I may. Then Brigadier General John Kelly was the ADC at the time MajGen Mattis authored the e-mail. Then Colonel Joe Dunford was his Chief of Staff. I am familiar with this as I am the “Colonel” who sent MajGen Mattis the original e-mail and subsequently rec’d his permission to distribute his response to my students at National Defense University Industrial College of the Armed Forces. If I had worked with officers like the General, I might have stayed in spite of knowing something was very rotten at the ‘core’ ( “eat the apple……….” some old USMC types will understand) in Vietnam. Too few like him and too many working for their plush retirement into the military/industrial complex. I hear the same truths from Marines today that we told back in Vietnam, every thing changes, nothing changes. “Brigadier General John Kelly was the ADC at the time”…. BGen Kelly is a USMC SAW grad; equivalent to US Army SAMS grad (better known as Jedi’s). No wonder he read more than Mattis. Pingback: With Rifle and Bibliography: General Mattis on Professional Reading | Strife | Are You Frick'in Kidding Me?